I don’t like olives at all, but, on the other hand, Chris loves them and keeps our fridge stocked with some type of olives at all times. 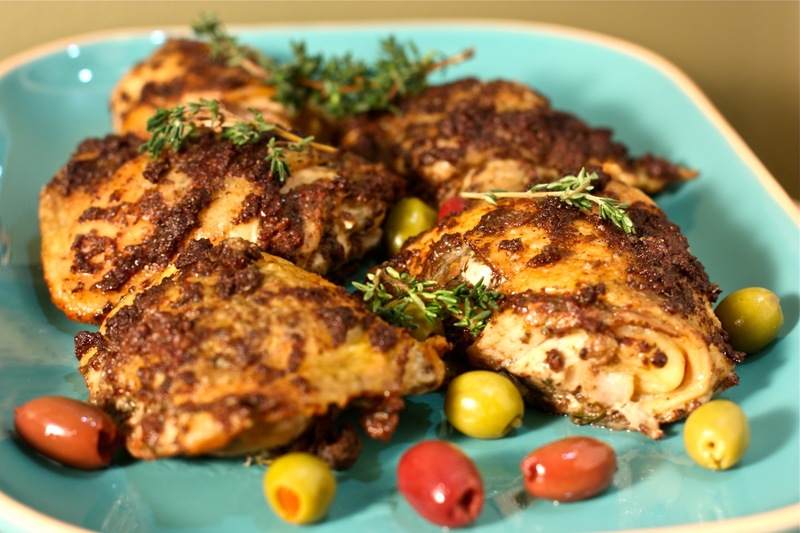 When I stumbled upon a recipe for chicken which incorporates olive tapenade, I knew he would enjoy it so I had to make it for him. The original recipe calls for roasting a whole chicken and three different types of olives, but I improvised by using what I had on hand – chicken thighs, some canned California green olives, and a big jar of kalamata olives. The recipe calls for making an olive tapenade first and then smearing it all over the chicken, even under the skin. Chris really enjoyed the tapenade, putting big dollops of it on some toasted baguettes. I tried it, but I really didn’t like it at all. Despite the other ingredients like capers, thyme, parsley, and anchovy paste, the olive taste was still too strong for me. I pressed on and massaged the chicken thighs generously with the tapenade and put them in the oven. While the aroma of the chicken cooking was delicious, I was a little leery of it. I knew I had to try it because it was the only thing I cooked for dinner. Boy, was I pleasantly surprised! Cooking the tapenade really mellowed the olive taste and brought out its saltiness. The flavors of the other ingredients melded together very well. I loved it on the chicken! This is another great way to prepare chicken, which is a little bit different from what we usually have at home. The recipe for the tapenade makes about 2 cups so use half for the chicken and the rest for some olive tapenade bruschetta. To make the tapenade, combine the olives, capers, parsley, anchovy paste, and thyme leaves in the work bowl of the food processor and process until finely chopped. If necessary, add a little more olive oil to achieve a wet paste consistency. Use as much as you want to cover the chicken, but this is a generous amount so the leftover tapenade may be served on the side. Rinse the chicken and pat completely dry. (The drier the chicken, the crispier the skin will be. Just sayin’!) Season with salt and pepper. Place a sprig of thyme under each piece of chicken. Rub the olive tapenade all over the chicken and carefully under the skin if you can. Cook until the juices of the chicken run clear and the skin is golden brown, about 35-40 minutes. The internal temperature of the chicken should reach around 175 degrees F for dark meat. Adapted from a recipe from Jenna’s Everything Blog. I made this dish for for four of us last night and received great acclaim. It’s a keeper! I’m thinking that next time, I might try to make a pan sauce with the juices and the tapenade that fell off during baking. Thanks for the inspiration! Oh. My. Gyawd. I’m a total olive fanatic, and I love tapenade. This looks incredible, Daisy! I’ll eat your olives for you, Daisy. And I would eat this delicious chicken. Mmm these look gorgeous, I love the tapenade! I love tapenade!! L.O.V.E! But I’ve only had it out at restaurants. I totally have to try making it at home soon. This dish sounds flavorful and delicious! Thanks Daisy.